I caught my wife, Karma, tracing out on a map the first few stages of this year’s Tour de France. Not that she was trying to hide what she was doing. Truth is, she is a huge fan of the Tour, with a love of France, and she likes to know when the Tour is visiting places she has been. I, too, love France, having worked there as a missionary for my church way back when Eddie Merckx was dominating professional cycling. I even have an old Merckx cycling cap I purchased as a young missionary. But I became enamored with the Tour when I took up bike racing myself and Greg LeMond was just starting to bust the legs of the European peloton. Since then, Karma and I have dutifully followed the Tour every year. We have even made two trips over together, and I have made one on my own, to personally watch a few stages of the Tour. With the available TV coverage these days, Karma and I spend nearly every evening, often late into the night, watching that day’s action. People who know me know they are not to discuss that day’s action or results with me or in my presence. Indeed, Karma sometimes can’t handle the anxiety, so she goes on-line to check the results. But for my sake, she keeps mum till I have finished watching that day’s action. Well, that is a long way of saying that I am excited that this year’s Tour de France will be starting up in a few days. To be honest, the Tour may be the main reason we don’t cancel our expensive cable TV service. And this year’s Tour promises to be a good one. For the first time in several years, the yellow jersey looks to be hotly contested. Chris Froome remains the favorite, of course, but only because he is Chris Froome. He appears more vulnerable than ever before, and he sees this year’s Tour as his greatest challenge yet. Richie Porte would be the favorite (for some he is), except for the presence of Froome. Nairo Quintana’s team, Movistar, claims that Quintana comes to the race in great form. And this is a course, with little time-trialing and a lot of climbing, that favors him. There are others who could also contest the yellow jersey. Alberto Contador and Alejandro Valverde come to the Tour in good form and are considered serious outside threats. Then there is the next generation of champions pushing to move to the top such as Romain Bardet, Thibaut Pinot and Fabio Aru. Still, Froome, Porte and Quintana are the top three contenders and this promises to be a tight race. As always, the yellow jersey is the main show. But part of the beauty of the Tour are all the other competitions. The polka dot jersey for the best climber (King of the Mountains), green jersey for the best sprinter (Points Competition) and white jersey for the best young rider classification (25 and younger) are always exciting to watch. Rafal Majka has to be the favorite for the polka dot jersey, having won it in 2014 and 2016. But this competition tends to be a bit hard to predict, as many of these climbers are working in support of their GC (General Classification) leaders or for their own GC chances. This often results in having to sacrifice focus and opportunities for mountain points. Thibaut Pinot has made this jersey his priority, despite his outside shot at a top GC finish or even victory. Also in the mix will be Thomas de Gendt and Ion Izagirre. In truth, there are several others who, if circumstances and form fall into place, could win this competition. As for the green jersey, well, Peter Sagan owns it, and has owned it for the last years. And for motivation, if he wins this year, he will equal the record of Erik Zabel who won the jersey six times. Indeed, he likely will not be happy till he has broken Zabel’s record. Being a great sprinter who wins races for big points as well as a guy who can often stick with the climbers for awhile as the other sprinters are dropped and scoop up intermediate sprint points, Sagan has each year methodically compiled enough points to end this competition well before the end of the Tour. His top challengers this year would seem to be Marcel Kittel, Nacer Bouhanni and André Greipel. But frankly, none of them seem to have the ability to battle for stage wins and intermediate sprints throughout the Tour as does Sagan, and so Sagan is the hands down favorite here. The white jersey doesn’t get the publicity that the others do, but it is a place to watch for future contenders. This jersey has been won in the past by Greg LeMond, Laurent Fignon, Alberto Contador, Andy Schleck (all future Tour winners), Andy Hampsten, Nairo Quintana (twice, in 2013 and 2015), and Thibaut Pinot, to name a few. That is a distinguished list. And the teams do take this competition seriously. So, watch for Simon Yates, whose brother, Adam, won this competition last year. Also keep an eye out for Louis Meintjes who took 8th overall in last year’s Tour, and Emanuel Buchmann who just finished the Criterium du Dauphiné in 7th place overall. All this is just the overall stuff. 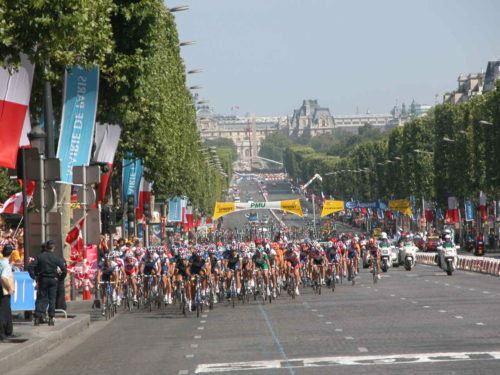 The Tour consists of 21 stages, and each stage is hotly contested. A stage win in the Tour can be the key to a good contract for the next few years, so riders and keen to win one. There will certainly be many different stage winners, and a host of different riders contesting the finishes on those stages. Some will be won in a mass sprint, while others will be won by a solo breakaway. And several will see a contested sprint between 2-5 riders. The dynamics will be different for most stages. That is why Karma and I plop ourselves down in front of our TV each evening of the Tour to watch the action play out. We get caught up in the competition and intrigue of each stage. Then there are the sideshows. I just saw a headline that Jan Ullrich, a German and one of cycling’s black sheep from the EPO era, will not be invited to the Tour’s start in Dusseldorf, Germany, a circumstance that has many current German riders somewhat upset. Oh, and Lance Armstrong’s name keeps popping up every time the Tour rolls around. He is, of course, persona non grata at the Tour, and for several years, Tour announcers Phil Liggett and Paul Sherwen were apparently not allowed to even mention his name. Nevertheless, each year Armstrong’s name gets brought up. And speaking of Phil and Paul, when will Phil finally retire? He makes enough gaffes to get most announcers fired, but he has been the heart and soul of Tour broadcasts as long as most of us can remember, and we do love him. Thankfully, Paul is a perfect color man to work with Phil. They complement each other, and listening to them call each race is a pleasure by itself. Well, those are my thoughts along with a few ramblings about the Tour. So, let me wrap up with thoughts on who will win this year’s yellow jersey. First, I am torn as to who to pull for. I like grand champions, and Chris Froome is one. It would be great if he could equal the five Tour victories of Eddie Merckx, Jacques Anquetil, Bernard Hinault and Miguel Indurain. On the other hand, how great would it be to see Nairo Quintana be the first Columbian to win the Tour? The country would go crazy for an entire year. Finally, Richie Porte epitomizes for me the true heart and soul of professional bike racing. He would be a great and deserving winner. In the end, I am rooting for Froome, and I think he will win. He has the drive, the tactical sense and the team to put him at the top of the podium. But mostly, it will be an exciting race to watch, in all its aspects, and the excitement will last for nearly a month. What sporting event can do that for you?